This fantastic 2 bedroom 2 1/2 bath townhome is in a guard gated community nestled among the fairways and greens of the coveted Key West Golf Club, and is fully furnished and comfortably appointed with all the necessities! Each bedroom has it's own attached bathroom, exterior balcony, and full linens. Downstairs features an additional half bath, and the kitchen overlooking the dining area and living room, perfect for entertaining. Living room sofa is a sleeper sofa to sleep 2 additional guests. All essential dishware and cookware is provided as well as added luxuries like a Keurig coffee machine, toaster, blender, and more. Large sliding doors open up to a spacious screened deck space for outdoor enjoyment. 2 private parking spaces with home. Convenient location near the lagoon-style pool with waterfalls creates a tropical oasis right in your backyard! The Key West Golf Club offers amenities including a resort pool, a small pool, a playground, butterfly garden and community center that houses a fitness center, restrooms, and convenient guest parking. Enjoy the masterfully designed Key West Golf Course, an 18 hole, 6,500 yard course with 1 set of clubs provided in the home! Previously listed as "Almost Heaven" but has been updated under new owners! 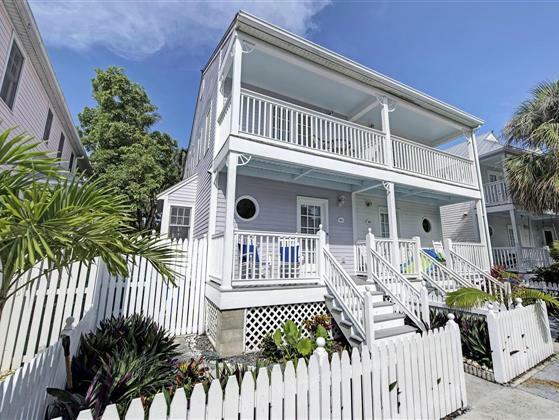 Old Town & World-Famous Duval Street only minutes away - property is conveniently located just 5 miles from the island's best shopping and dining! White sand & palm trees at Smather's Beach and Higgs Beach, and stunning views at Fort Zachary Taylor State Park! 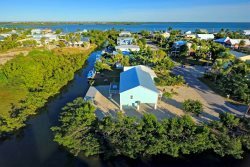 Nearest marina is Sunset Marina, and a short boat ride to Key West or Garrison Bight. Near Southernmost Point and Mile Marker 0, Key West Lighthouse, Ernest Hemingway Home & Museum, Harry S. Truman Little White House, Key West Historic Memorial Sculpture Garden, Audubon House & more! 12.5% Sales tax applicable to each fee. Under certain conditions such as severe weather, fire or other hazardous conditions, or situations involving a particular rental property beyond our control, Century 21 Schwartz Property Sales, Inc. reserves the right to cancel any reservation. If Tenant cancels the reservation, owners or their agent will attempt to rebook the premises at the same rate. If owners or their agents are able to rebook the premises, tenant will receive a refund less a $100.00 cancellation fee. 100% refund if canceled at least 60 days before arrival date. 50% refund if canceled at least 30 days before arrival date. You must contact the owner directly to request cancellation. Please notify us as soon as possible of cancellation and then send a WRITTEN NOTICE OF CANCELLATION. Please ask the agent about CSA Travel Protection Insurance.